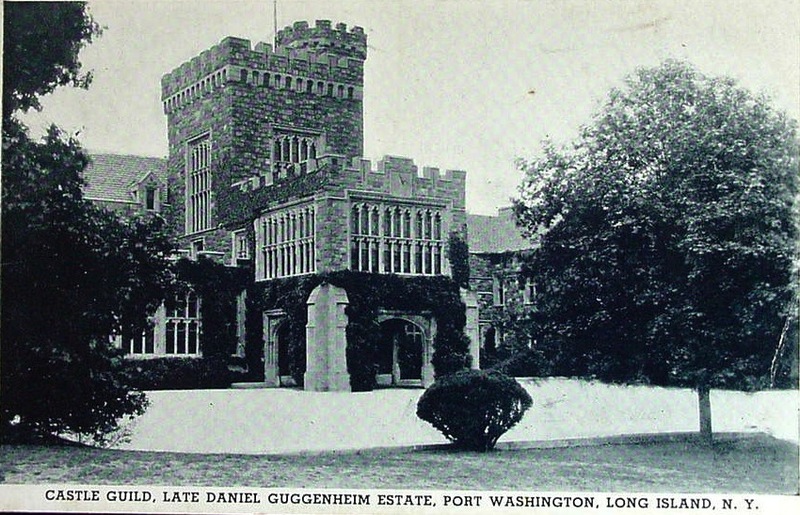 'Castlegould', originally designed for Howard Gould by Hunt & Hunt c. 1909 in Sands Point and photographed here under the ownership of Daniel Guggenheim who renamed the estate 'Hempstead House'. Click HERE and HERE for more on the estate. Click HERE to see 'Hempstead House' today. The ongoing conversation has been "park" and house are in need of attention. Has anyone been lately to say something about current condition or plans for the future? Was part of a wedding this past summer honestly the public areas looked fine really amazing woodwork. Outside there are still sections of stone walls that seem to need major repairs. It is too beautiful a house to be left rundown. Cold, gloomy old pile. All that magnificence for naught. The vines don't help a bit. It may appear that way from the outside, and due to a lack of maintenance it is a little "frayed" looking, but the interiors have held up well . . . the sunroom (pictured here) faces south & is a magnificent space; think of the first Mrs. deWinter's bedroom in Rebecca. The palm court lets in an awful lot of light to the center of the house, and the loggia overlooking the Sound (facing north) is surprisingly light & breezy. "think of the first Mrs. deWinter's bedroom in Rebecca." I heard all the steel beams need to be replaced, is that true? The county will never pay for that. Flo...what a great article. Too bad most Long Islanders don't feel the same way as those in the article. That place has been for sale for as long as I can remember. At least since 2008. Granted I can remember things past 2008.